Looking to build a jobs site? It turns out, it's pretty easy -- all you need is WordPress an one of the many great plugins/themes listed below. There are a million reasons that you would want to build a job board. If you have a startup, you can save thousands, and plenty of time, by using WordPress and a plugin instead of building something from scratch. Or if you have a recruiting website, you may want to include job posting and search functionality. Regardless of the reasons, there are many ways in which you can turn WordPress into an excellent job board. We've taken a look at dozens of solutions for building a job board, and found the best ones to list below. These are the ones that have all of the functionality you would expect in a job board, including applications, resume management, and job search. They also are the ones that are most highly reviewed. The king of the job board plugins/themes is JobEngine. If there's any specific feature you're looking for, JobEngine is sure to have it. It is both a theme and a plugin, so everything works out of the box. JobEngine can recreate any major jobs site in minutes, and has plugins for dozens of payment systems, including Stripe and Braintree. It can connect to sites like eBay and Indeed, and it has multiple alert functions, ratings, and import tools. It has built-in payment plans, gateway connections, and resume management. 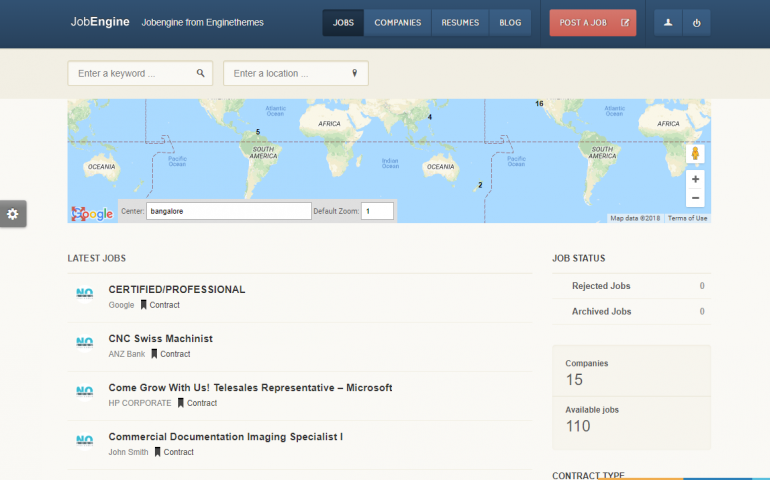 JobEngine is our favorite job board plugin/theme because it has many customization options, is SEO optimized, has map integration, offers multiple color choices, is skinable, integrates with social media, and offers excellent free suppport. This theme is easy to install, although it can take a while to understand everything it can do. JobEngine is mobile friendly and multilingual. Although it is not free, you can't possibly go wrong with JobEngine. If you don't love the look of JobEngine, JobMonster is a great alternative. This job board theme/plugin has most of the same features as JobEngine, but it has more look and feel options, including a half dozen different home page versions. 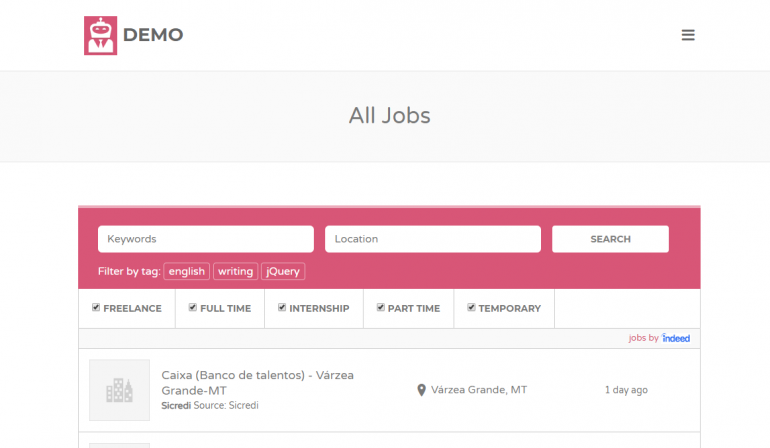 JobMonster also has some interesting features of its own, that some of the other options don't have. For instance, it has built-in apply over Facebook and Linkedin. Of course, it also has the standard features that all of these job board plugins have, such as job posting and search, resume upload, job matching, and alerts. 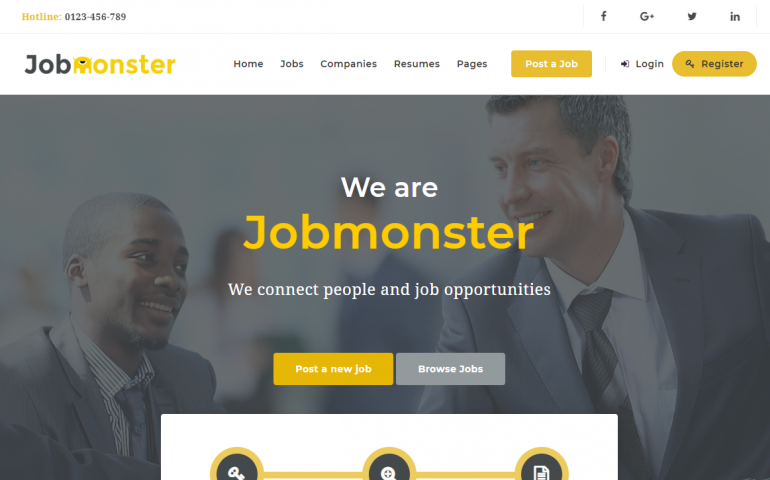 JobMonster has a large user base, so it is quick and easy to find help and support. However, it has many options, making configuration complicated. WP Job Manager is the most widely used FREE job board plugin. It has a lot of useful functionality, but it's not as complete as some of the other solutions above. There are a lot of additional features available for WP Job Manager as plugins, but you have to pay in order to have access to them. Some of these include applications, bookmarks, custom fields, company profiles, and integrations with other products. You will also need to buy a theme separately in order to make WP Job Manager look decent, which is an additional cost. Still, if you're looking for a free job board option, and you're willing to live without certain features, you should check this one out. If you don't want to spend much money, but you want something more featured than WP Job Manager, than Specialty is for you. Specialty is built on top of WP Job Manager, and provides as theme, as well as additional functionality, for a very low price. Some of the main aspects of Specialty include: it includes plugins, provides built in search, has many customization options, is SEO optimized, has a drag and drop builder, has a 1-click install process, offers multiple color choices, is skinable, integrates with social media, offers free suppport, and includes multiple layouts. Specialty also includes all of the icons, background images, fonts, a slider plugin, and custom widgets to make your WP Job Manager site look truly professional. JobRoller is another great theme option for your job board site. This theme/plugin is feature-filled, and it contains everything you need to build a great looking, and functional site. JobRoller has full resume management functionality, including a resume database, custom job types, payment gateway plugins, and full transaction logging. It also supports recruiters, includes plugins, provides built in search, has many customization options, is SEO optimized, has map integration, has a drag and drop builder, offers multiple color choices, is skinable, integrates with social media, and offers free suppport. JobRoller enjoys a large user base, so it is simple to find help and support. 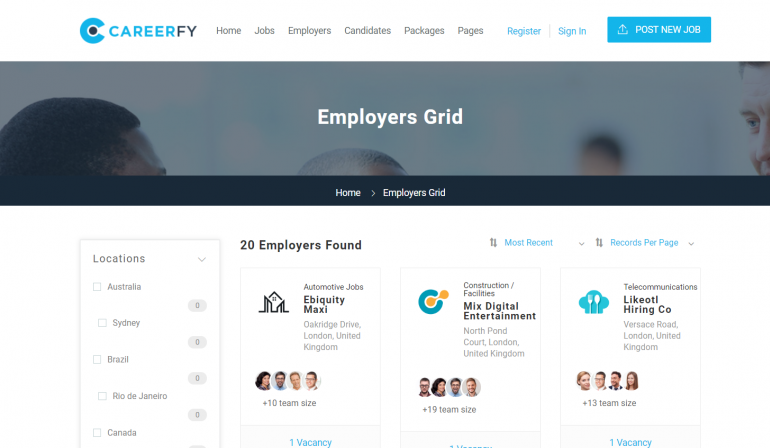 This job board plugin/theme is titled Careerfy, and it has plenty of cool features. These include application deadlines, application tracking, social media applications, integrations with major job sites, a resume builder, a resume manager, and more. Additionally, it provides built in search, supports Adsense, has many customization options, is SEO optimized, has map integration, has a drag and drop builder, supports WooCommerce, offers multiple color choices, is skinable, integrates with social media, and offers free suppport. The drawback of Careerfy is that it is not free and doesn't have the feature set that some of the choices above have. Nevertheless, this theme is an excellent option for your website.